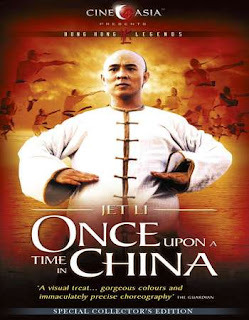 Once Upon a Time in China 1991 Chinese | FunToMovies 300 Movies '+g+"
Set in late 19th century Canton this martial arts film depicts the stance taken by the legendary martial arts hero Wong Fei-Hung (1847-1924) against foreign forces’ (English, French and American) plundering of China. When Aunt Yee arrives back from America totally westernised, Wong Fei-Hung assumes the role of her protector. This proves to be difficult when his martial arts school and local militia become involved in fierce battles with foreign and local government. As violence escalates even Aunt Yee has to question her new western ideals, but is it possible to fight guns with Kung Fu?